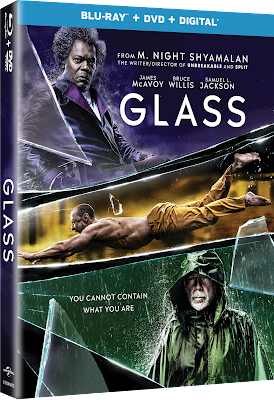 Home » Expired Contests » Enter to Win Glass on Bluray! Enter to Win Glass on Bluray! GLASS is a grounded-in-reality, comic-book thriller where the heroes and villains are people first. The thrilling culmination to the trilogy that started with Unbreakable and Split, stars James McAvoy (Split, Atonement), Samuel L. Jackson (Hitman’s Bodyguard, Avengers Franchise), Bruce Willis (Unbreakable, Die Hard), Sarah Paulson (Ocean’s Eight, “American Horror Story”) and Anya-Taylor Joy (Split, The Witch). Go inside the mind of master of suspense M. Night Shyamalan to uncover the connections and references that bring the three films together in one universe. Experience more than sixty minutes of never-before-seen features elaborating on his process and artistic vision including an in-depth look at the making of the film, deep insights on the characters, a never-before-seen alternate opening, and deleted scenes. Glass is available on Digital April 2nd and on Bluray April 16th, 2019.